Free Placemat Pattern- And it’s Not Broomstick Lace! 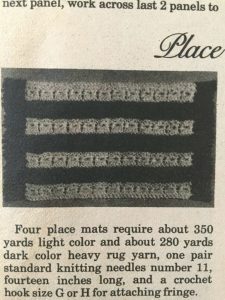 When I first saw this pattern in the 1967 February magazine I thought it was broomstick lace, which I’ve always loved but can’t remember ever trying. 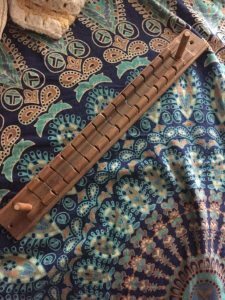 Spoiler alert- It’s NOT broomstick lace! It’s actually a very easy knit lace pattern that mimics broomstick. 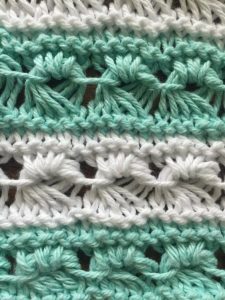 It’s called the Estonian Shell stitch, and it’s actually very beginner friendly! The only actual stitch needed is the knit stitch, the rest of it is just moving yarn around. So when I started the pattern I ran into some difficulties. The top one being that it used a thick rug yarn, and not realizing that I had already bought some worsted cotton. I can’t even easily think of a thick yarn on the market that would make easy, pretty, affordable placemats. The second problem was that I could not for the life of me get their method for the shell stitch to work. It was pretty, but it was not like the picture, and did not look like broomstick lace. I sent it over to a friend, “Hey, knitch this swatch and send me a picture.” Worked for her, her friend had some trouble but got it to work. It seems to depend on if you knit English style or Continental. But the variant I’m going to tell you works no matter what! So, I decided to completely rewrite the pattern to utilize modern yarns, and an easier variation of the stitch. Since I wrote this pattern I’m going to share it here with you for free! Tell your friends, send them over to get their copy free too! This stitch is super fun, easy, works up fast, and I would actually really love to make a baby blanket out of it. For the yarn in mine I used “Premier Home Cotton” which also has some polyester in the blend, to help it last and not shrink as much as some cottons do. I bought it at AC Moore. I really enjoyed working with it, except the red. Don’t use the red. To give credit where it is due the red didn’t bleed after washing, (Surprise!) BUT it was SO fuzzy. Just red lint and red fuzz all over the place. Made my nose tickle like crazy, made my white stripes look pink with fuzz. I was especially excited for the red, because years ago (and I mean YEARS) I made some wash clothes with regular red and white cotton, and to this day they bleed when wet. I was excited that this brand wouldn’t bleed, but I was not expecting that fuzz. Per placemat you’ll need about 2.5 ounces of the main color (mine is pale aqua) and about 1.5 ounces of the contrast color (mine is white.) You’ll need size 8 needles. Row 4- Knit the first stitch, slip the needle through the next 5 stitches, dropping the extra loops as you go, so you will end up with 5 long stitches on your right needle. Now, switch those five long stitches back to your left needle. In all 5 together knit, yarn over, knit, yarn over, knit. You’ll do that twice on the swatch, to the last stitch, knit that last stitch. Sounds complicated, but don’t worry. Just be sure you are in control of all the stitches. No stitches are actually dropped completely. At the end of this row you should be back to 12 stitches on your needle. I’m hoping to make a video later this week to show this stitch, when I do I’ll link it here. But just try it! What have you got to lose? That is the pattern. So if you want to make a blanket, or scarf, just use that swatch to calculate how many stitches to cast on. Be sure your final number is a multiple of 5 plus 2. I’ll give you a hint, it won’t work on the modern “Blanket” Yarns and big needles, the lace hole comes out huge. And it’s all very thick. The pattern! Here we go folks! You’ve practiced the stitch! You’ve got your yarn and your needles, go ahead and cast on 77 stitches. Complete 6 rows of the stitch pattern with the main color (MC). Complete 9 sections total, ending with the MC. Cast off. I used the last row of the last section as my cast off row, instead of ending with three rows of knit. 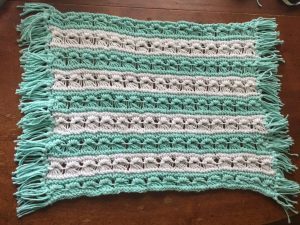 Your finished placemat will be about 13×16″ not including fringe. You can choose to spread it out and steam it into shape if you’d like. I like mine floppy and ready to throw on the table. Super easy. Now, add fringe. If you happen to have one of these guys, it works great! Just wrap, cut at the middle line and at each end. If you don’t have one of these a 4 inch length of cardboard will work. Just wrap and wrap and wrap and then cut at the ends. This pattern is on Ravelry! If you’d like to queue it up and save it for later you can do so here! If you have ANY problems please say so in the comments! I’d love to see your finished projects if you follow the pattern! I’d really, really, love to seem them. Truly! Now you can make vintage styled placemats in modern yarns! Next Post: April?!?! Where Did YOU Come From?!!?! ?